On Dec. 1, a camera on-board NASA’s STEREO spacecraft recorded a wave of electrically charged material shooting out from the sun and blasting Mercury. 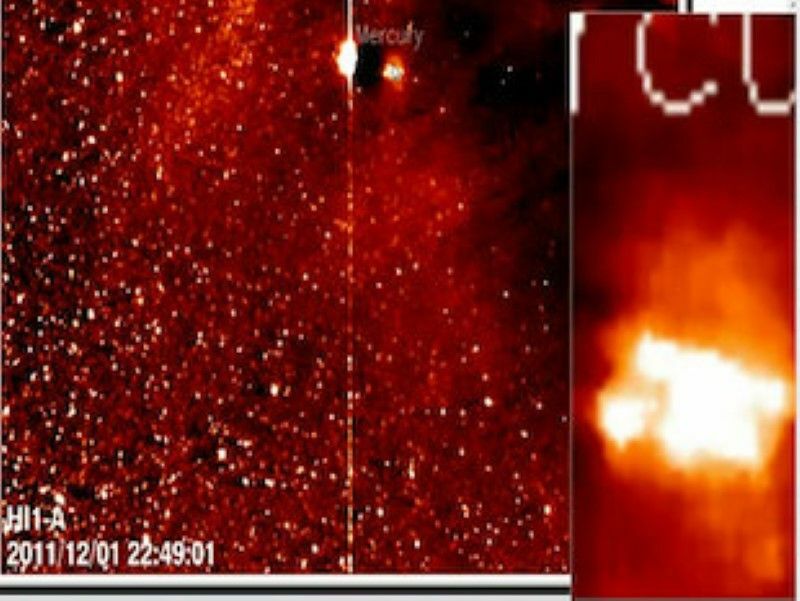 Footage of this “coronal mass ejection” (CME), as such events are called, has caught the attention of alien-hunters, who say it has unveiled a giant, “cloaked” spaceship parked near the solar system’s innermost planet. In the footage, one sees a huge spurt of plasma and other solar ejecta washing over Mercury; peculiarly, the material seems to flare up as it hits another nearby object, too. “It’s cylindrical on either side and has a shape in the middle. It definitely looks like a ship to me, and very obviously, it’s cloaked,” YouTube-user siniXster said in his video commentary on the footage, which has quickly spread across the Web. The commentator says there’s “absolutely no explanation” for the nearly Mercury-size mystery object other than that it’s a spaceship . “What object in space cloaks itself and doesn’t appear until it gets hit by energy from the sun?” siniXster asked. The question was meant rhetorically, but nonetheless, the video is curious, so we’ve put it to scientists in the solar physics branch at the United States Naval Research Laboratory (NRL) — the group that analyzes data from the Heliospheric Imager-1 (HI-1), the telescopic camera that shot the new footage. As you might suspect, there is a non-UFO explanation of the apparent flare-up near Mercury. According to Russ Howard, head scientist of the NRL group, and Nathan Rich, lead ground systems engineer, it is simply an artifact left over from the way raw HI-1 telescope data gets processed. Rather than a UFO mothership parked near Mercury, the bright spot is “where the planet was on the previous day,” Rich told Life’s Little Mysteries. To make the relatively faint glow of a coronal mass ejection stand out against the bright glare of space — caused by interplanetary dust and the stellar/galactic background — the NRL scientists must remove as much background light as possible. They explained that they determine what light is background light, and thus can be subtracted out, by calculating the average amount of light that entered each camera pixel on the day of the CME event and on the previous day. Light appearing in the pixels on both days is considered to be background light and is removed from the footage of the CME. The remaining light is then enhanced. This works great for objects far off in the distance, such as stars, which don’t move much relative to the sun. But it gets a little trickier when trying to account for nearer objects, particularly moving ones, like planets. “When [this averaging process] is done between the previous day and the current day and there is a feature like a planet, this introduces dark (negative) artifacts in the background where the planet was on the previous day, which then show up as bright areas in the enhanced image,” Rich wrote in an email. He noted that the bright spot disappears when the CME footage is reprocessed using pixel values from a different day — the day after the CME, for example — to remove background light, instead of pixel values from the previous day. Those in favor of the bright spot being a cloaked UFO mothership rather than a data-processing artifact will surely point out that the spot in question is not round like the ghost of a planet, but rather sharp-edged like the Starship Enterprise . This image shows the average light coming from Mercury and the surrounding region of space on Nov. 30 subtracted from the average light coming from the region on Dec. 1. On both days, the track of the planet creates two streaks. And they have a point: A high-resolution image of the spot shows that it is composed of two roughly parallel lines. “The pixels which form the two parallel lines are where the circle from the planet and the bleeding pixels (cross-like features) overlap as it progresses across the field,” Rich wrote. In other words, because Mercury moves over the course of each day, and because saturated pixels bleed light into adjacent pixels, an averaged image of Mercury from the previous day looks like two streaks, rather than an orb.